Monaco is a destination like no other. It is the second smallest country in the world, less than two square kilometres in size it is perhaps the most glamorous little stretch of land on the planet. The scenery is dotted with deep blue sea, graceful palm trees and vibrant flowers. The most dramatic feature is the steep rock jutting out into the Mediterranean called “Le Rocher” (The Rock). Monaco is also a home to the most renowned casino in the world which is constantly surrounded by fast luxury cars such as Ferrari, Bentley or Lamborghini. This country though small in size offers many fun attractions and the good news is you don’t have to own a great deal of money to experience them. Here are some reasons why Monaco should be on your must-visit list. Monaco is located by the Mediterranean Sea which makes it a perfect spot for sunbathing, relaxing and swimming in the warm water. Even during the winter months when the rest of Europe is freezing cold you will till most likely be able to enjoy a warm climate and plenty of sun. Beside the well maintained beach the area boasts many seaside restaurants and brasseries where you can enjoy delicious French food and refreshing drinks. Monaca’s casino is the iconic building in the principality and probably one of the landmarks most familiar to you when thinking of Monaco. It is one of the most famous casinos in the world, particularly as it was built in the flamboyant Beaux Arts Style in 1893. The marble atrium is lavish in style. There are 28 onyx columns that welcome you to the Gaming Rooms. Fans of James Bond will enjoy the scenery as this is said to have been the setting for the James Bond Novel “Casino Royale”. There is different gaming rooms decorated according to the themes. Make sure you look up at the stunning artwork as you try your luck. To escape the heat for a while and some light-hearted fun, you can find a well equipped bowling alley in the heart of Monaco. Open solely in the afternoons from 2 Pm onwards. You can spend time for a few hours of entertainment here. There is no need for an introduction for racing fanatics; the Monaco Grand Prix is one of the main Formula 1 races in the calendar each year. The racing tradition in the principality started in 1950 and usually takes place around May. What makes it more special is that it cuts through the streets of the city past Boulevard Alberta and past the famous Monte Carlo Fairmont Hotel. Monaco is a home to some of the world’s most reputable restaurants along with a whole host of delicious local cuisine. Whatever your taste buds are looking for in the principality, Monaco should be able to provide with vigour. You’ll find Italian and French Fusion when it comes to the Principality’s cuisine. Some of the best restaurants are Blue bay, Le Louis XV, Joel Robuchon Monte Carlo, IL Terrazzino etc. One of the beautiful buildings and landmark of the principality, the Oceanographic Museum is a must to see. Perched on the cliffs overlooking the Mediterranean, it houses various exhibitions throughout the year as well as it is an impressive aquarium. An aquarium is situated in the basement that holds more than 6000 specimens. Perfect for tired leg sightseeing. Hop on Monaco’s little train to tour the city. Lasting for 30 minutes, the tour takes you around all the sights of Monaco feeding you all the interesting facts and figures. It runs all year round from February to November. Rainier III outdoor swimming stadium allow the kids to spend the afternoon cooling off and splashing around in this open air pool right on the harbour. It’s run by the municipality and the rates are reasonable, considering its Monaco. Interesting facts is that in the wintertime it is turned into an ice skating rink. 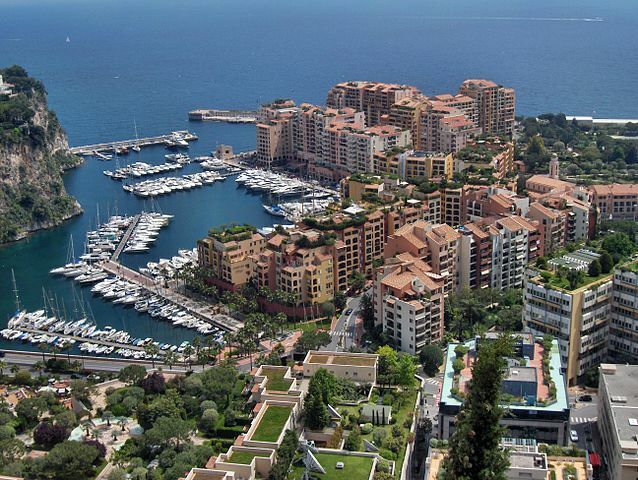 Monaco is filled to the brim with luxurious hotels to stay. This is why if you’re looking for an indulgent treat destination for a particular celebration there is really nowhere better than Monaco. Hotel Hermitage Monte Carlo with its Gustave Eiffel Dome and opulence wherever you look is the best. A sweeping marble staircase, chandeliers and designers clothes at every corner. Monaco’s shopping centre definitely doesn’t disappoint. It is known for its opulence which also means that you can expect to find a good range of upscale shopping opportunities here. The shopping centre consists of three floors and there are plenty of seats to rest your weary feet, plenty of Photo opportunities too. Avenue Princess Grace, named in honour of Grace Kelly is also another good choice if you want to find some elegant clothes and accessories. Monaco has a selection of luxury spas which offers relaxing treatments for visitors to the country. Thermes Marin Monte Carlo offers luxury tailor made treatments, including sweater based treatment, wellness programs, massages and more and has been a part of the spa scene in Monaco for nearly a century. Imagine having a unique, romantic and fun date night on the Mediterranean coast. Doesn’t sound too bad. Enjoy a night at the Monte Carlo Opera House. It’s usually booked, so make sure you plan ahead. For a more casual date night, try to view the sun as it sets over Monaco. There are several places that are great for sunset viewing as the principality is perched on a cliff .Larvotto Beach and Place du Palais are two favourites. Monaco’s tourism is the main driver of events and activities all year round. Expatriates working in Monaco have plenty of choice in terms of leisure activities over weekends, during holidays and festivals. There are several major events each season from sporting events to arts and culture and festivals. Pack your bags for a balmy weather and holiday of hedonism in sunny opulent Monaco.